In early 2016 we embarked on production of our most recent short animated film project, Nothing to Declare. The film was a collaborative project alongside another local studio, with Interference Pattern taking on the aspects of production relating to the visuals of the film, including the look development, full 3d asset creation followed by the lighting, rendering and compositing for the full film. Interference Pattern’s creative director Tom Bryant took on the role of both art and technical director for the film. Our partner in the film was Scottish animation studio, Once Were Farmers who covered the pre-production, edit, layout, rigging and animation, with Will Adams (studio owner at OWF) as the films’ director. World renowned comic book artist Frank Quitely was the writer and designer with Mal Young of Studio Temba as the films’ producer. The film tells the story of the return home to Glasgow of the lead protagonist, Chris, from his travels in South America, only to find his family in the grip of a terrifying transformation. 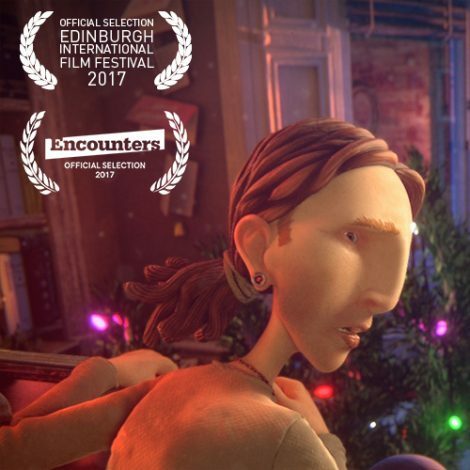 The films’ concept had been selected as one of the successful applicants to the SFTN – Scottish Shorts short film development and production programme and commissioned for production with a very modest production budget attached. To assist in making the film a reality a crowd-funding campaign was run on Indiegogo to raise more funding and the project was lucky enough to receive some corporate sponsorship from Glasgow-based business Primestaff, to help us top up the coffers and hit our crowd-funding goal. Even with this extra small injection of funds, as with most short film projects most of the work would be funded by the studios ourselves. The imagined world we were to create would be a stylized interpretation of reality, with detailing enlarged and over-sized but object construction remaining as per real-world counterparts. Adding this layer of realism to the construction of the 3d models would hopefully add to the viewer’s immersion within the visual world we were conjuring. Character designs were completed by Frank Quitely and environment and layout design by renowned 2d and layout artist (and author of the wonderful history of animation layout, Setting the Scene), Fraser McLean. With the pre-production phases of the project being undertaken at Once Were Farmers, Interference Pattern’s involvement in the production kicked off with the full 3d asset builds and continued through to final delivery of the final graded sequence. First to be tackled as part of the 3d build were the characters and local 3d sculptor Martin McGhee came on board for the project. Martin has worked with us on many projects over the years, including the cutesy characters in the commercial for Dobbies. Working with some basic designs from Frank, we worked up the initial block-ins, and quickly resolved these into the final 3d designs. The characters were sculpted in Zbrush, a 3d sculpting software that attempts to give the artist an approach to 3d modelling that is more akin to real-world clay sculpting than the point-pushing of traditional 3d modelling. An element that remained slightly unresolved was how we would approach the hair of the characters. Characters often use complex hair shading models and simulations to virtually emulate the look and feel of real hair fibres. Whist these techniques can look fantastic we knew that they would be out of the scope of what we could achieve with this project’s budget. With this in mind we opted for a much simpler approach, with the hair being sculpted and rendered as a traditional 3d surface. This approach would be one of the stylistic choices that we have to make as a concession to being able to let us make the film. 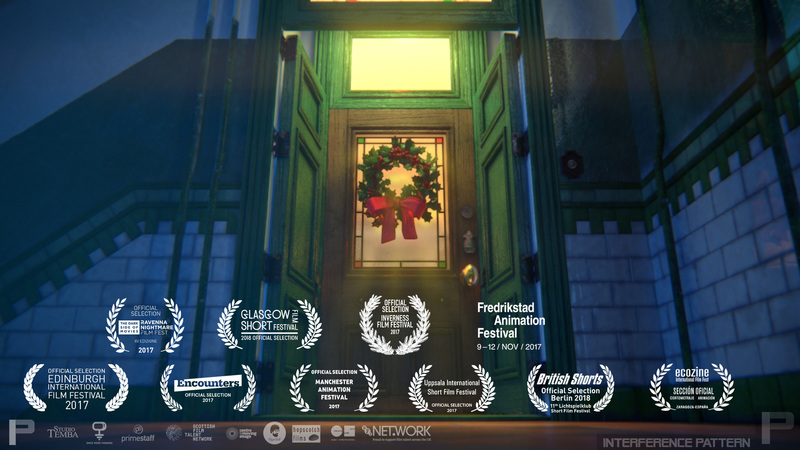 The location for the film is a traditional “tenement” flat in Glasgow and as such were to be re-creating our version of a specific style of living space, albeit in stylized 3d. We split the environment build into separate rooms, with each one being assigned to an artist to take from concept through to a fully textured model. The first stage of any build is to block out the general proportions of the model. To aid us in this process we were provided a basic layout mesh from the director Will, which he had been using to pre-visualise the cameras and general layout design. From this we were able to quickly build the room layouts and start to fill with the appropriate details. Care had to be taken to ensure that we emphasized and upscaled the correct details such that we retained our stylized approach whilst also maintaining recognisability. We wanted the viewers of the film to feel immediately at home within the environment and not to be distracted with any out of place design. Progressing through the environments we firstly complete the modelling, which is followed by the slightly more technical task of giving all of the geometry what we call UV maps. These allow us to define how to lay 2d texture artwork onto the surface of a 3d mesh. Whilst not the most creatively inspiring part of the 3d animation process, it’s vital to do a good job at this stage to ensure distortion free mapping on the final model. With the UV’s all completed we moved onto the final stage of the model build process, the texturing. This involves creating specific 2d imagery and projecting that onto the surface of the model, via the UV map, to give it it’s required colouration and appearance. It’s what makes our wooden floorboards for example, look and react to light like you would expect a wooden floorboard to. Using a mixture of 2d image editing software such as Photoshop and 3d texture painting software Substance Painter, we were able to create textures for all of the 3d models in the film in a very respectable timescale. The entire build for the project comprised of six separate rooms (stairway, hallway, kitchen, living room, bedroom and exterior street), four characters and a multitude of small props items which were used to both populate the scenes but also as animation props for the main character. These ranged from set-dressing elements for the environments such as the bespoke nativity scene on the mantlepiece, to a stuffed unicorn toy, placed high up on a high shelf in the sister’s bedroom. With the 3d models and textures now complete we were able to commence the 3d look-development and lighting process. This is where we start to add specific lighting into a scene to illuminate the objects and create the desired look and mood. Without this most-important of stages the scenes would look completely dark. Our aim was to generate a preset template lighting scenario or setup, for each room, which would act as an initial platform into which the animated characters and final approved cameras could be imported. This would hopefully save us time during the lighting phase of production, avoiding unnecessary duplication of work. Continuity in visuals between separate shots within each room would also be ensured, as each shot would use the same initial base lighting setup. Even using these base lighting setup templates, bespoke edits would be made to the lighting on a per-shot basis, to ensure that each shot looked as good as possible and was not restricted by any limitations of the initial setup that were made apparent when rendered through a specific shot’s camera. Each room was to have a distinct lighting direction, to convey a particular mood, as per the director’s vision for the film. The living room for example was to feel “hellish” with the sisters bedroom scene at the end of the film turning a lurid clash of overly saturated pinks and greens. Extra lighting is nearly always added to any characters in a shot, to enhance their look and presence. Specifically additional rim-lighting helps to pull the form and outline of the characters out from the surrounding background environment. Additional colouration in this lighting also can assist in emphasis of the mood. Without this extra lighting attention, characters often look “flat” and uninspired. The process is analogous to the extra lighting that would take place on a film set. With lighting setup of a shot completed, the full sequence of frames that comprise the shot is submitted for rendering on the render farm, which processes all the computations required to generate the final rendered imagery, ready for compositing. 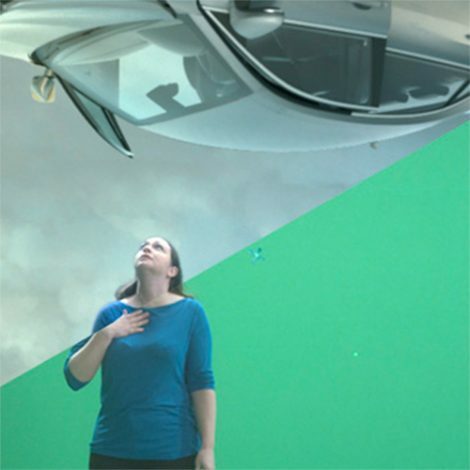 The compositing stage involved taking the ungraded cgi renders, splitting them into the component layers, grading, tweaking and fixing before finally re-combining, along with any additional effects, to create the final desired image. Realistic camera artefacts, volumetrics and degradation effects were also added at this stage to help to further enhance the visual feel of the shots. Overall there were 78 shots in the film, each one requiring individual bespoke lighting and compositing and requiring many man-hours of painstaking work, to take the film from start to finish. The result is a beautiful looking film that we feel is sure to visually please.